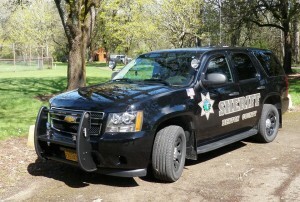 The Benton County Sheriff’s Office features this vehicle on its Facebook page. Benton County residents will want to keep an eye on their sheriff’s experience with “autogas.” Sheriff Scott Jackson has announced that most of his department’s patrol vehicles will be refitted with a dual fuel system, allowing them to run on either conventional gas or propane. If this proves as efficient and economical as the sheriff hopes, private citizens who drive a lot may be tempted to do the same. The Benton County commissioners authorized spending up to $84,000 on the conversion of the sheriff’s several Ford Crown Victorias and Chevy Tahoes, one Ford Expedition, an F-150 pickup and a Ford van used to shuttle inmates to and from various jails. The vehicles will use gasoline to start up and immediately switch to propane. And if they run out of propane — on a long chase, say — they’ll switch back to gasoline. Jackson hopes the newly retrofitted rigs will be running this summer. The hoped-for savings are based on the assumption that propane costs $1.25 per gallon less than gas. Let’s hope there are no unwelcome surprises on that score. This past winter CoEnergy, the local propane supplier, had to explain to its customers why prices were rising “almost daily.” The bitter winter was to blame, along with a pipeline issue. Hopefully they can save some money….it is nice to see some in government thinking that way. On the 2-4 year turn around for a financial payback; most police vehicles get replaced before 4 years of age, so they need to weigh that into the formula as well. Let’s hope they keep the vehicles 2-4 years so they pay for the cost of conversion. How about- Not allowing them to replace a converted vehicle until the conversion HAS paid for itself?